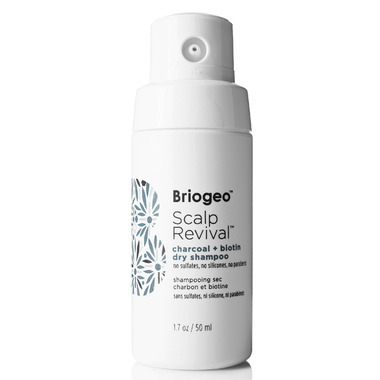 What it is: This unique, scalp-healthy dry shampoo infuses Binchotan charcoal to draw impurities from the scalp and detoxify the scalp and hair. A complex of clay and tapioca & rice starches absorb excess oil at the roots to refresh, clean, and extend the life of your blowout. Witch Hazel extract helps to normalize oil production to prevent an oily scalp, making this dry shampoo a solution oriented product as opposed to just a temporary fix. Super-vitamin, Biotin, provides essential nutrients to the hair follicle to support healthy hair growth. What it does: Refreshes, cleanes, and extends the life of your blow out. As well as strengthens, soothes, and balances for optimal scalp health, which fights the causes of oily hair at the root of the problem. Suggested Usage: Shake well before use and twist the cap to reveal spray dispenser. Squeeze the bottle and dispense evenly five inches away from hair, focusing at the roots. Let the dry shampoo sit for two minutes and then brush or finger through the hair thoroughly until the powder is removed. Binchotan Charcoal: Detoxifies the scalp and draws out impurities that clog the hair follicle or that cause buildup on the scalp. Bamboo: Improves natural sheen of the hair, while increasing strength and elasticity. Also helps protect and reinforce the hair. Rice Starch: Rich in antioxidants that conditions and protects the hair and scalp. Ingredients: Oryza Sativa (Rice) Starch, Zea Mays (Corn) Starch, Kaolin Clay, Sodium Bicarbonate, Manihot Esculenta (Tapioca) Root Starch, Sodium Hyaluronate Powder, Bambusa Arundinacea (Bamboo) Powder, Biotin, Hamamelis Virginiana (Witch Hazel) Leaf Extract, Charcoal Powder, Citrus Aurantium Dulcis (Orange) Peel Oil, Prunis Persica (Peach) Fruit Extract, Fragrance. Love this dry shampoo!!! I have tried many, many dry shampoos and this one is the holy grail. It smells amazing-fresh and not overpowering- and rubs in really well in my dark hair. I am proactive about using dry shampoos and apply it at night on day 1 and 2 of not washing my hair and in the morning my typically oily hair looks great. My only complaint is the packaging. I hate these "puff" dispensers (I have also tried the ones by Aveda and Acure which use the same packaging). I always end up unscrewing the puffer and pouring it into my hands which is wasteful. I wish Briogeo would use the typical shaker type bottles. I will likely buy a shaker and pour this powder in or use one of my old ones from a different brand. The only dry shampoo that compares to how good this one is Captain Blankenship's Mermaid Dry Shampoo. I've been using this product for just over a week now and so far it has been great. It doesn't leave that sticky or heavy feeling most dry shampoos leave. The one downside is the packaging. It seems like the nozzle gets clogged every time I use it. This is a quick fix, as you just have to give the bottle a couple good shakes and you're good to go. This product smells great, applies without leaving white patches (once rubbed in gently/shaken around). The packaging is interesting in that you twist the top and squeeze the tube to make the product "puff" out. It doesn't always come out in a steady amount/spray. I often have to shake it and spray a section a couple of times. Overall it works well, doesn't irritate my sensitive skin. As someone with an extremely sensitive scalp -- including psoriasis break outs I was reluctant to try dry shampoo as they are usually strongly scented and irritating. This product has a mild natural scent and is effective post yoga class at lunch. I have dark hair and it blends perfectly. A great product!